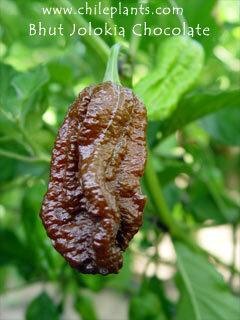 All photos Copyright © Cross Country Nurseries BHUT JOLOKIA CHOCOLATE - super hot; Habanero Elongated; 3 to 3.5 inches long by 1 to 1.25 inches wide; medium thick flesh; matures from green to brown; pendant pods; green leaves; 24 to 30 inches tall; Extremely Late Season (120+ days); a new color of extreme heat; this one is extremely late season, needing over 120 days. ; C.chinense. 20 seeds.